Often we layout a sequence of bitfields as a contiguous sequence of bits. When the AST record layout does this, we represent it in the LLVM IR's type as either a sequence of i8 members or a byte array to reserve the number of bytes touched without forcing any particular alignment beyond the basic character alignment. This will end up as the following LLVM type. The first array is the bitfield, and the second is the padding out to a 4-byte alignmnet. Definition at line 65 of file CGRecordLayout.h. Definition at line 83 of file CGRecordLayout.h. Definition at line 86 of file CGRecordLayout.h. Definition at line 894 of file CGRecordLayoutBuilder.cpp. Given a bit-field decl, build an appropriate helper object for accessing that field (which is expected to have the given offset and size). Definition at line 683 of file CGRecordLayoutBuilder.cpp. Definition at line 885 of file CGRecordLayoutBuilder.cpp. Whether the bit-field is signed. Definition at line 74 of file CGRecordLayout.h. Referenced by clang::CodeGen::CodeGenFunction::EmitLoadOfBitfieldLValue(), and clang::CodeGen::CodeGenFunction::EmitStoreThroughBitfieldLValue(). 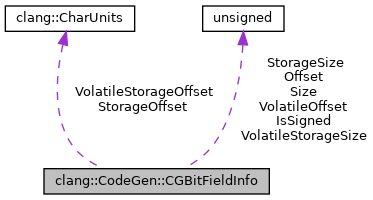 The offset within a contiguous run of bitfields that are represented as a single "field" within the LLVM struct type. This offset is in bits. Definition at line 68 of file CGRecordLayout.h. Referenced by clang::CodeGen::CodeGenFunction::EmitLoadOfBitfieldLValue(), clang::CodeGen::CodeGenFunction::EmitStoreThroughBitfieldLValue(), and getAccessFlag(). The total size of the bit-field, in bits. Definition at line 71 of file CGRecordLayout.h. Referenced by EmitAtomicUpdateValue(), clang::CodeGen::CodeGenFunction::EmitLoadOfBitfieldLValue(), clang::CodeGen::CodeGenFunction::EmitStoreThroughBitfieldLValue(), and getAccessFlag(). The offset of the bitfield storage from the start of the struct. Definition at line 81 of file CGRecordLayout.h. Referenced by clang::CodeGen::CodeGenFunction::EmitConstructorBody(), and getAccessFlag(). Definition at line 78 of file CGRecordLayout.h. Referenced by clang::CodeGen::CodeGenFunction::EmitLoadOfBitfieldLValue(), clang::CodeGen::CodeGenFunction::EmitLValueForField(), clang::CodeGen::CodeGenFunction::EmitStoreThroughBitfieldLValue(), clang::CodeGen::CGObjCRuntime::EmitValueForIvarAtOffset(), and getAccessFlag().